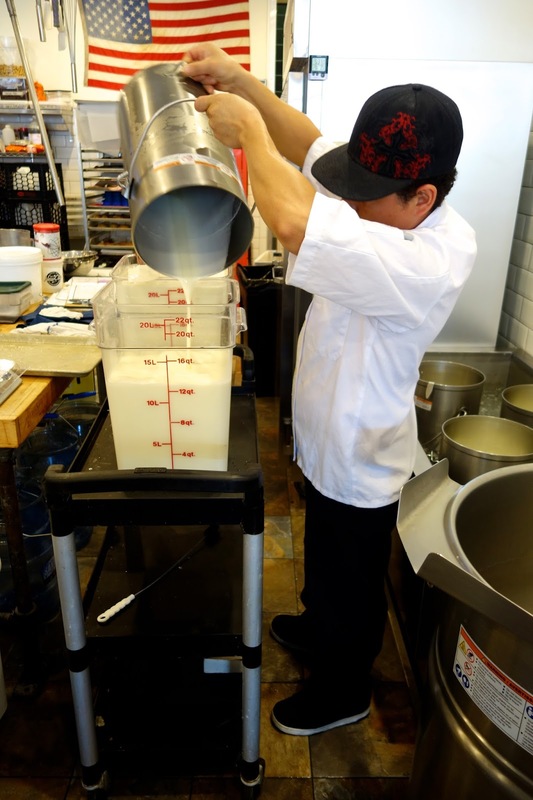 Sugar Fix: New City Microcreamery | Pop.Bop.Shop. When you've lived in the same city for a long time and you dine out often, combing for new places is a bit like trolling Match.com. You have to ask yourself, "How far am I willing to set my radius to find the one?" Is it five miles? Ten miles? Twenty five miles? 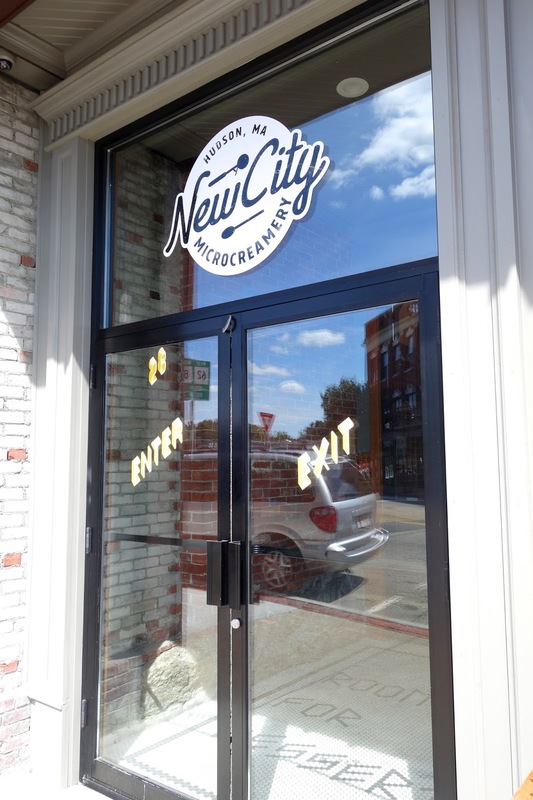 When I first heard about New City Microcreamery, a new ice cream operation making unique flavors with liquid nitrogen, I was immediately intrigued. However, when it was then revealed to me that they are located in Hudson, MA, a full 35 miles from my front door, I was hesitant. Let me tell you, driving those 35 miles turned out to be worth every minute. Also, people in Hudson actually stop for you when they see you standing in the crosswalk. Sigh, rural living. When I arrived, I met one of New City's co-owners, Karim El-Gamal. Karim co-owns New City with Michael Kasseris and Jason Kleinerman. 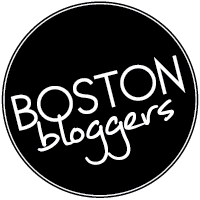 Karim and Michael met in business school at Babson and Michael and Jason have been friends since elementary school. Karim was my host for the afternoon. We began our tour outside, across the street from the creamery. While standing opposite the building edifice, Karim explained how he, Michael and Jason decided on this space for their frozen treat mecca. Karim and Michael co-own a restaurant across the street called Rail Trail Flatbread Co. (more on that later) and customers kept asking for ice cream on the menu, but they didn't have any freezers in the restaurant. So the guys started to think about how they could bring an ice cream place into Hudson. They didn't want to do frozen yogurt or soft serve, they really wanted to create something high end and premium, while bringing something special and unique to the community. In dreaming up this new venture, they took the same approach they did at Rail Trail. Karim explained, "We are committed to great quality food. At our restaurants, we feed you like we feed our own families." Thus began two years of ice cream research (my kind of gig!). The guys traveled all over the U.S. and to several different countries to uncover the best of the best in the ice cream universe. Once they settled on their ideal methods and sourcing, it was time to find the perfect location. They didn't have to look very far. In fact, they just had to walk across the street! New City's space was originally built in the 1800s and was completely abandoned when the guys put in their offer. Because the building was protected by the town's historic commission, they had to maintain the integrity of the original structure. Turns out, it was their absolute pleasure to do so. When you approach New City, the first thing you notice is the huge outdoor patio. Karim detailed for me that the old exterior of the building actually jutted out further than the current outdoor space. 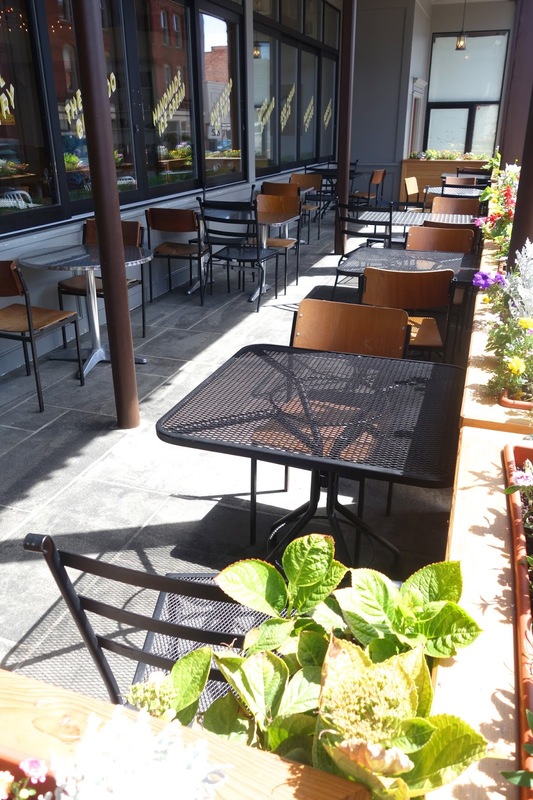 When they began construction, they built the patio themselves. I love that the windows facing the patio advertise their offerings with cute phrases like "Tasty Treats." The patio is incredibly spacious. Though I was there very early in the day on Saturday, I am positive after dinner those seated are all taken! While we were standing outside admiring the new look of the building, Karim showed me the original columns that they kept from the building's bones. They even maintained the detailed wood work on each column. In fact, when they had to add some additional columns, they commissioned a team to build new columns to mimic the old ones exactly. They are even looking for someone to recreate the detail work. At the base of the patio are a few rows of bricks. The guys sourced bricks to match the originals, again, paying homage to the heritage of the building and the town. In so many ways, New City honors the town of Hudson, including its name. Back in the 1840s, the first people to settle in Hudson called it "New City." The guys liked this name as a nod to the community that has been so accepting to them. 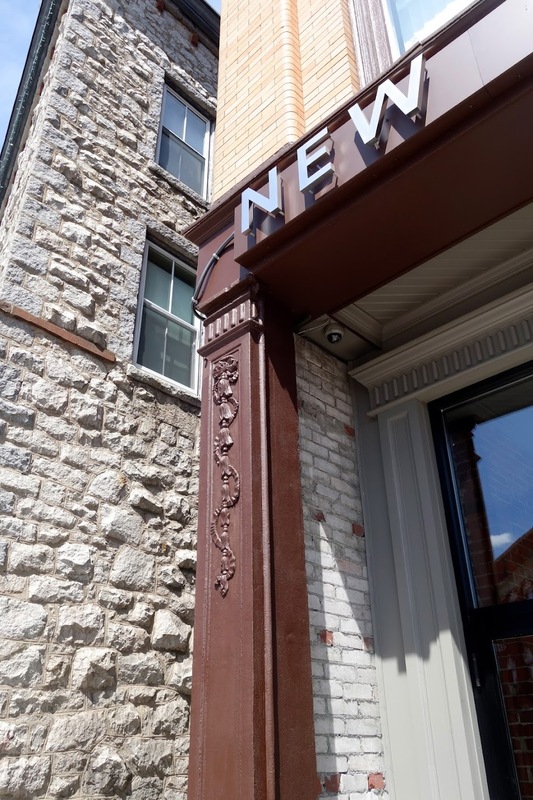 In fact, since opening their businesses, all three owners have moved to Hudson! 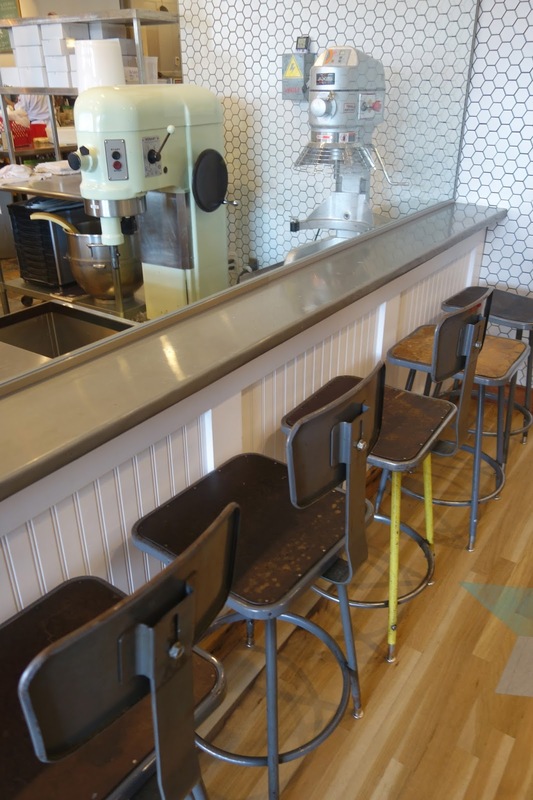 When you open the doors to the microcreamery, you step onto a tile floor that reads "Room for Dessert" with arrows pointing toward the second set of doors. Let's be honest, there is always room for dessert. Karim told me that the expression in the tile was a wink at their Rail Trail customers who had been asking for this for so long. Now if they have room for dessert after dinner, they can just cross the street to indulge in a round two. Inside, the place is spectacular. Karim could see how wide eyed I became and he said, "Going out for ice cream is a special occasion. Whether you are five years old or fifty years old, you love ice cream. We wanted our place to feel fun and exciting." 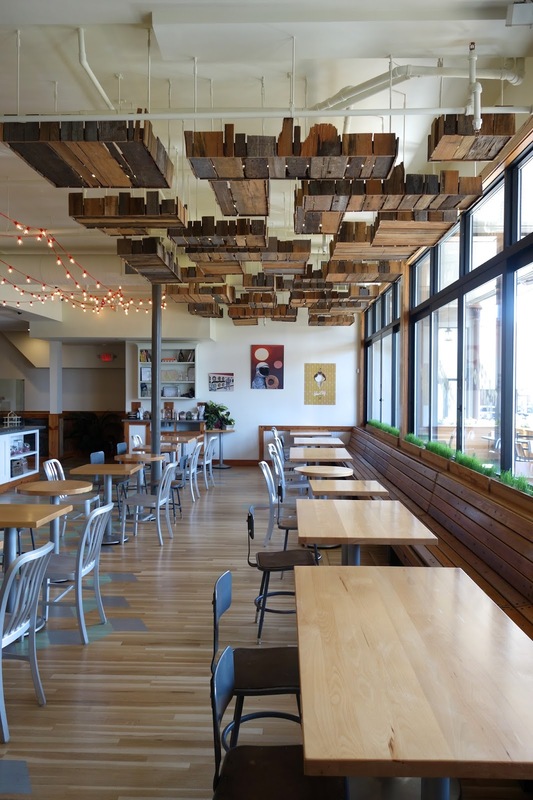 The ceiling is decorated with light fixtures made from recycled milk crates. Karim commented, "We like to take old things and make them new again. There are several pieces and items around the space where we've done that." 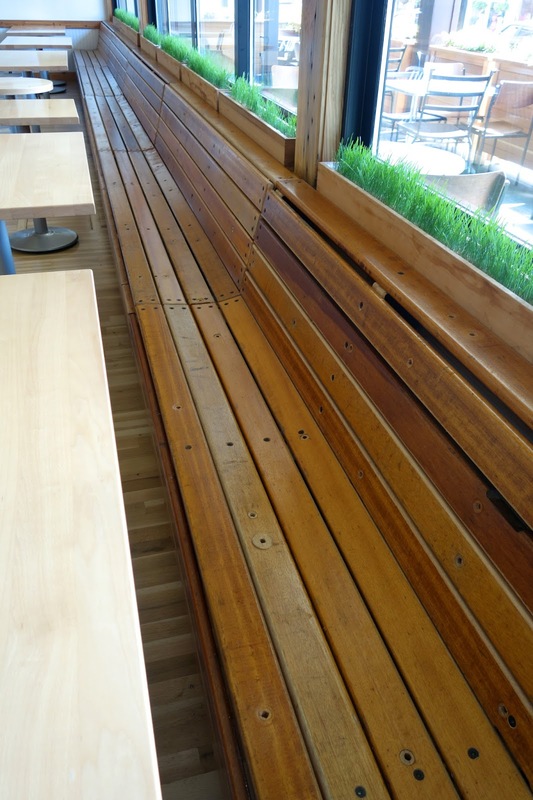 For example, the benches along the front window are recycled bleachers from the local high school. (That's wheat grass growing on top of all the benches. Don't worry, they don't put in the ice cream). 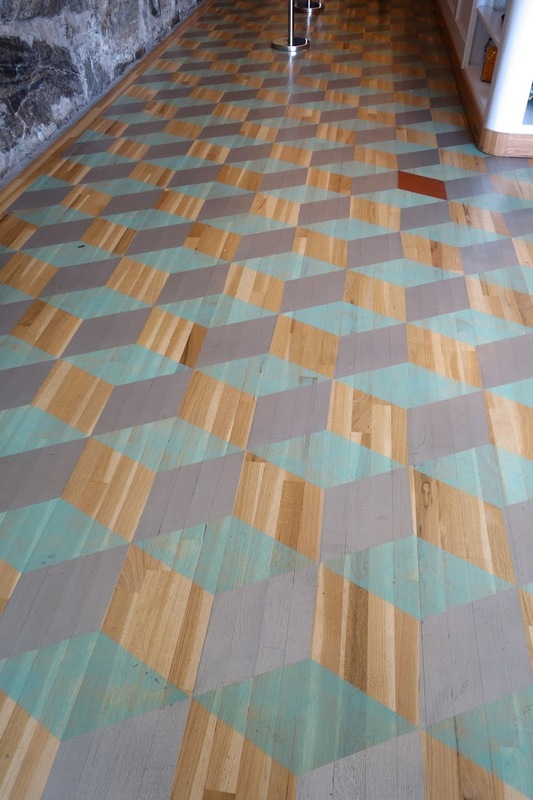 Not only did the guys pay special attention to their lighting and furniture, they also hand picked the flooring to add to the fun, celebratory feeling. Along the right wall, where the line begins to form, you can see the original stone that was uncovered during the restoration process. Rather than cover it, the team decided to keep it. Notice the panda artwork above? All throughout the space there are ice cream themed tributes, including this hilarious one from "Pulp Fiction." 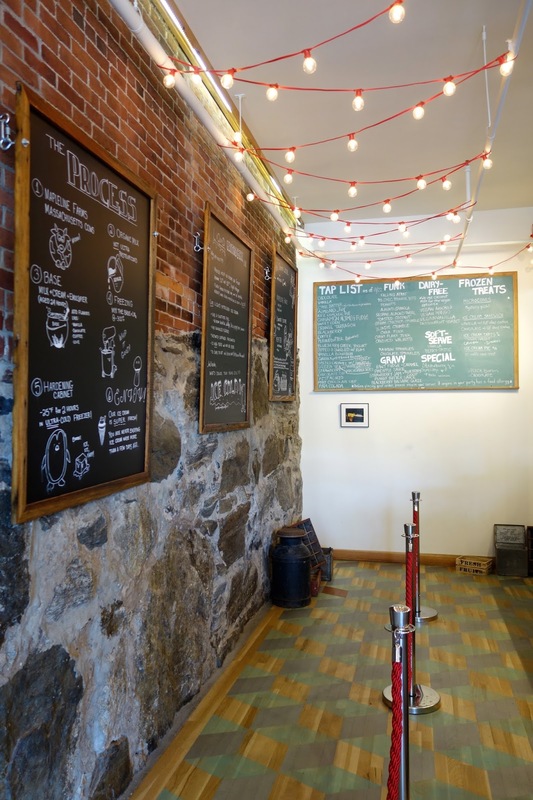 As you wait in line, you can read all about New City on the blackboards hanging on the wall. The first board recites the New City manifesto, which ends with, "And most of all, remember to have some fun!" 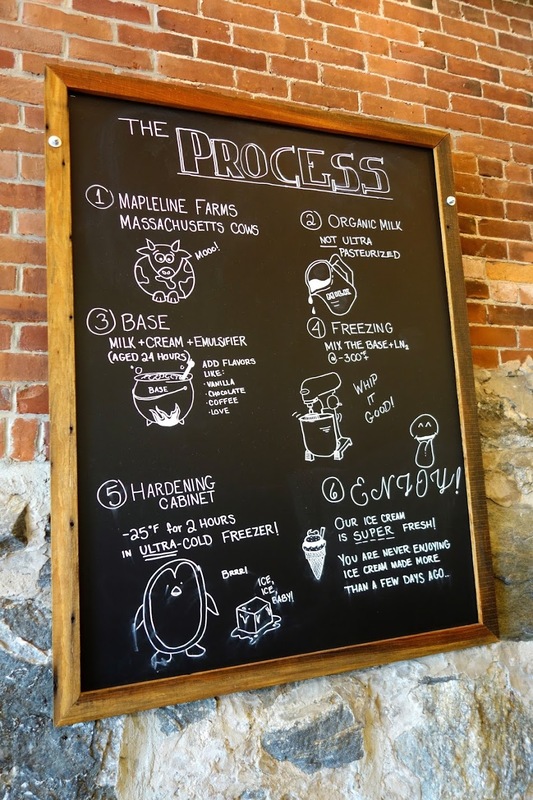 The second board explains New City's ice cream making process, starting with local sourcing. I feel like a broken record every time I write this, but supporting your local farming community is so important! 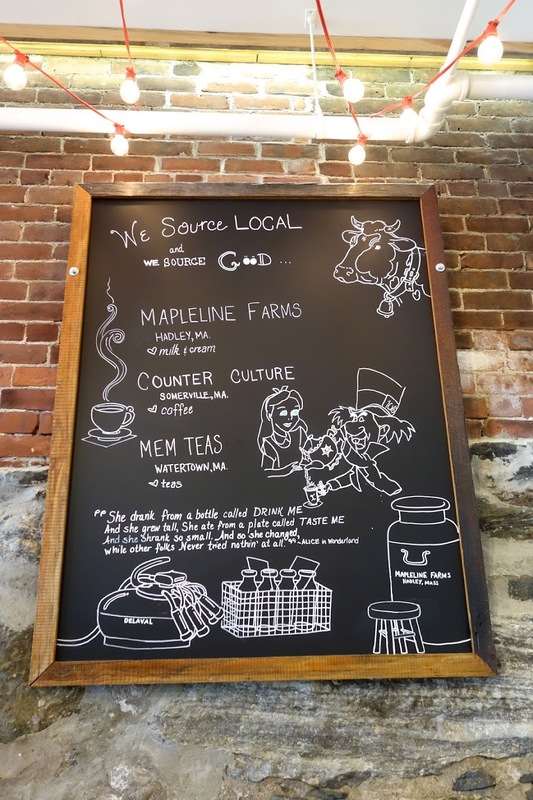 New City gets their milk, cream and butter milk from Hadley, MA. They make all of their ice cream bases in house. They also make their own soft serve bases, which is highly unusual. When testing flavors, the team submerges the add ins while making the base so that you get a much more pure and saturated flavor. Karim emphasized, "Flavor is the most important thing. When we add ingredients in, we are thinking about their natural flavors, how to best bring those out and how they will be survive (and thrive) in the freezing process." New City uses liquid nitrogen to freeze their goods, which is the fastest way to freeze (and also the most magical looking!). Note the Vanilla Ice reference on the blackboard. Stop, collaborate and listen. Someone on the team is definitely musically inclined because there are song lyrics all over the boards! The final board showcases all of New City's local partners, including their coffee and tea. The team's commitment to local is very sincere. 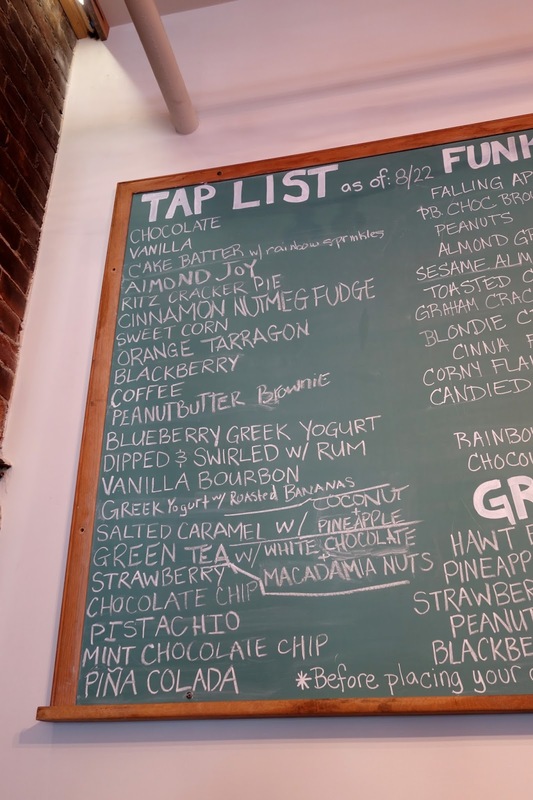 Now we come to the big kahuna chalkboard, the tap list! Karim described, "We see ourselves like a microbrewery. We have the flexibility to change our flavors anytime, based on what's fresh. Our batches are micro in size, compared to the huge national suppliers." I have to admit, when I saw the plethora of options, I was totally overwhelmed. Karim assured me that the team knows the lengthy list can be intimidating, so when a line starts to form, New City puts "flavor ambassadors" sprinkled throughout the line to explain the tastes of flavors people may be interested in or curious about. The ambassadors bring samples while you are waiting, so by the time you reach the front, you're ready to make your decision. All samples are delivered on real silver spoons. I couldn't believe it! Talk about making ice cream feel like a special occasion. I feel like every ice cream sample I've had in the past five years came on one of those tiny, neon, plastic spoons shaped like a beach shovel. Am I right? Karim also pointed out that you cannot see any of the ice creams from the line, they are all under the counter. The New City team wants guests to choose flavors by taste, not by sight. At this point in the tour, Karim asked me which flavors I would like try. About four in, he looked up and declared, "You know what. You are trying all twenty three!" I hesitated, but he insisted. So, ladies and gents, you're welcome. I tasted every single flavor for you. Chocolate - While plain chocolate is a simple flavor, New City's version is wonderfully rich. Cake Batter - This isn't just any cake batter ice cream, this is like funfetti birthday cake in a bowl! It would be very easy to devour a pint of this at a time. Almond Joy - This was my first pick, as Almond Joy candy bars are my absolute favorite. The base was rich with coconut flavor. There was a perfect ratio of chocolate to coconut. Ritz Cracker Pie - I have to admit, I had no idea what is normally in Ritz Cracker Pie, let alone Ritz Cracker Pie ice cream. For a quick second I was nervous it might have meat (I know, that's insane). Karim said this flavor was their pastry chef's idea. It wasn't terribly memorable. Cinnamon Nutmeg Fudge - This tastes nearly identical to Cinnamon and Chocolate Bits, a flavor made by Batch ice cream in Jamaica Plain, MA. The cinnamon and nutmeg take you right to holiday season and make you long for a fleece blanket and a warm fire. Sweet Corn - I first had sweet corn ice cream at the Rosa Mexicano ice cream festival and though I thought I wouldn't like it (where's the chocolate?) it's actually strangely comforting. The corn flavor feels so perfect for summer. Orange Tarragon - This tasted like a Creamsicle, with a hint of spice on the way down. Blackberry - I've had many renditions of Black Raspberry in my life, but not Blackberry. This was very subtle. Coffee - This is real coffee ice cream. 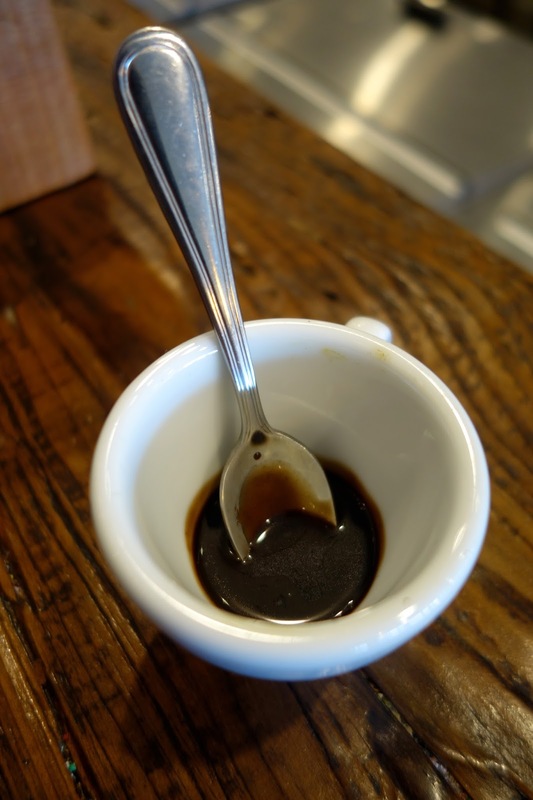 It's made with Counter Culture coffee and you'll be buzzing after just one bite. Peanutbutter Brownie - After one bite I felt like I'd eaten an entire peanutbutter cup! Blueberry Greek Yogurt - I've purchased a similar flavor from Ben & Jerry's at the grocery store. This version was super smooth with a hint of blueberry flavor. Dipped & Swirled with Rum - This flavor was a rum base, caramel and waffle cone pieces dipped in chocolate. Need I say more? I loved the taste of the chocolate mixed with the crunch of the cone. It actually reminded me of Magic Shell. Vanilla Bourbon - This flavor was in my top three! It has a serious boozy flavor. The whole time I kept thinking how delicious it would taste on top of a warm brownie. Greek Yogurt with Roasted Bananas - It's well documented that I am not a fan of fruit dessert, but this flavor tasted better than a real banana. Put some kind of chocolate topping or sauce on here and you'd be over the moon. Salted Caramel with Coconut and Pineapple - Karim admitted that this flavor was created after a mistake in the kitchen. The team decided to serve it anyway and customers loved it so much that they request it if they don't see it on the tap list. Green Tea with White Chocolate and Macadamia Nuts - This sounds like it would be a weird flavor combination and it is. The green tea flavor is very strong. Too strong for me. Strawberry - Much like the Blackberry, this has a simple, singular fruit flavor. Chocolate Chip - There are so many chocolate chips in here, you can feel yourself getting a cavity! Pistachio - I'm not into pistachio and I begged Karim not to make me taste this, but when I did, I must admit, it had a very generous amount of actual pistachio nuts. Mint Chocolate Chip - I have never tasted fresh mint as strongly as I did in this rendition and it was awesome. You know how when you order normal Mint Chip, you hope there is at least one piece of chocolate in every bite? In New City's version, there are ten in every bite. It's heavenly. Pina Colada - In my notes I wrote, "tastes like a tropical vacation." The coconut flavor was so pure. Creme Brûlée - Save the best for last! This was one of my favorites. I have no idea how they managed to get the signature cracked sugar of a creme brûlée to withstand the freezing process, but they did and it's amazing. Karim let me in on the secret, "We make trays of caramel, it hardens and then we break it into super small pieces. 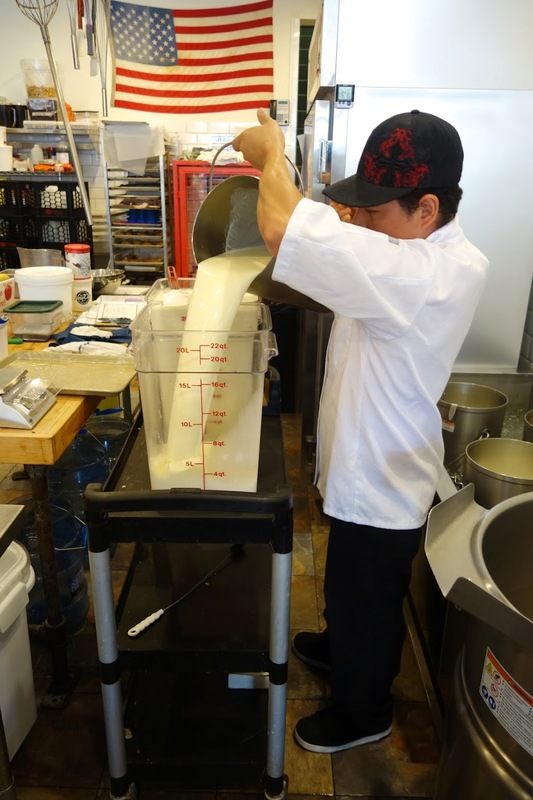 Those pieces go right into the base as we make the ice cream at that very first stage." In addition to sampling my way through the entire tap list of ice cream, I also gave two flavors of vegan ice cream a whirl. Vegan Vanilla - This flavor is so delicious that you would have no idea it's vegan. With vanilla, it's hard to mask anything since it's such a simple flavor, but this tastes like the real deal. Vegan Avocado - This was one of the creamiest flavors I tasted - dairy or vegan. It reminded me of the avocado ice cream at Rosa Mexicano for their "guacamole" dessert. For my final silver spoon, I dipped into one of the flavors of sorbet. Passion Fruit - This was so fresh! I felt like a passion fruit had been pureed into the carton just seconds before it hit my lips. Thank goodness I was wearing a maxi dress because I was getting quite full after tasting my way through the entire frozen menu. As we made our way down the counter, Karim was sure to point out the "Funks" a.k.a. toppings. Many of these are made in house like the roasted coconut, the almond granola and the cinna-funk (their version of Cinnamon Toast Crunch). Karim noted that the Funks are out in the open so people can "eat with their eyes." I was also able to taste some of the sauces and drizzles. First I sampled the blackberry balsamic glaze. It had a nice tang to it and I could tell immediately it belonged on top of a creamy flavor to help cut the richness. Next up was the hot fudge, which Karim served me in a teeny tiny espresso mug. The fudge had a strong, singular chocolate taste. They make this with the good stuff! For the grand finale of the ice cream options, I was able to enjoy one of New City's microcones. They are always available and the flavor is always a mystery! In addition to all the frozen confections, the coffee and the tea, New City also has a full pastry program, run by Elaine Stella. Prior to New City, Elaine worked with Kathy Sidell of the MET Restaurant Group in Boston. Like the co-owners, Elaine also had dreams of running an ice cream shop. When she joined forces with Karim, Michael and Jason, it was magic. Karim shared, "Elaine has been instrumental in every single flavor we make that involves a baked good. 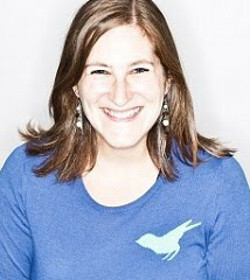 She is always giving us new, inventive ideas." As you can see, the pastry case at New City is stocked! And much more! I asked to try the coconut macaroon, which I promptly dipped into my espresso mug of hot fudge. It was such a sinful combination that I forced Karim to try it. I offered that if he'd like to add it to the menu, he could call it the "Molly macaroon." Just as we were about to wrap our tour, I was able to meet the executive chef, Tom Kepner. I couldn't resist asking him which flavor of ice cream was his favorite and with zero hesitation he said, "The dipped and swirled with rum." He also told us that he'd just gotten a crate of apples from their nearby neighbor Bolton Orchards and was testing all kinds of new fall flavors, including a smoked apple sorbet. One of the coolest things about New City's setup is the open kitchen. You can watch the team making waffle cones, creating bases, mixing in ingredients and of course, freezing with liquid nitrogen. Sadly, my visit wasn't timed with a moment where they were doing the freezing process, but if you are lucky enough to visit when that happens, there are chairs set up right next to the mixer to watch it happen. Karim painted a picture for me, "When we add the liquid nitrogen, the smoke just billows down over the sides and across the floor so that our whole team looks like they are walking through a cloud." As our tour was coming to an end, Karim insisted on sending me home with a pint of ice cream. Of everything I tasted, I was really into the Vanilla Bourbon, the Cake Batter and the Mint Chocolate Chip. I was worried as a whole pint that the Vanilla Bourbon might be too boozy and that the Cake Batter might be too sugary. So I went with the Mint Chocolate Chip and blasted the air conditioning all the way home so it would survive the 45 minute, 90 degree drive. Over the course of my visit, I was able to meet all three owners and the executive chef. Through my conversations with each of them, I continued to be so impressed by their commitment to local (both sourcing and to the community), their culture of experimentation, their passion and their openness. 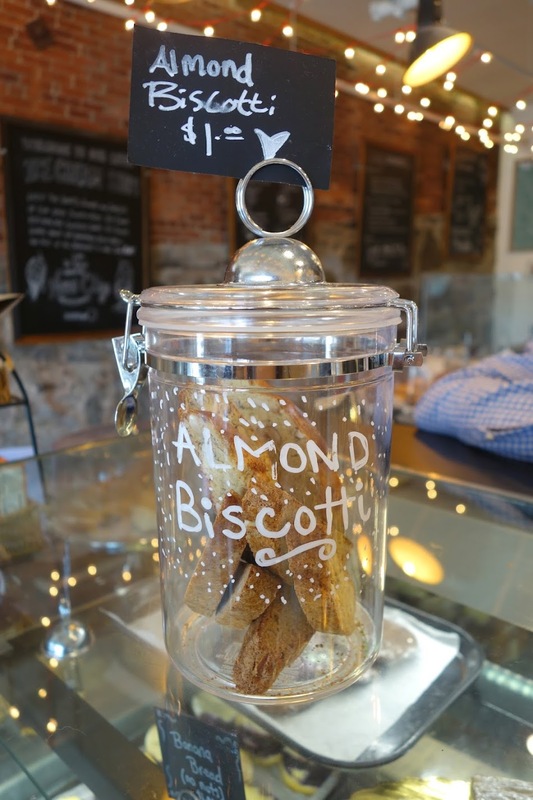 Every decision they make is thoughtful and purposeful (and delicious). It sounds corny, but these guys reminded me why I love doing this. I left New City feeling so energized about the experience and giddy to share it with you. 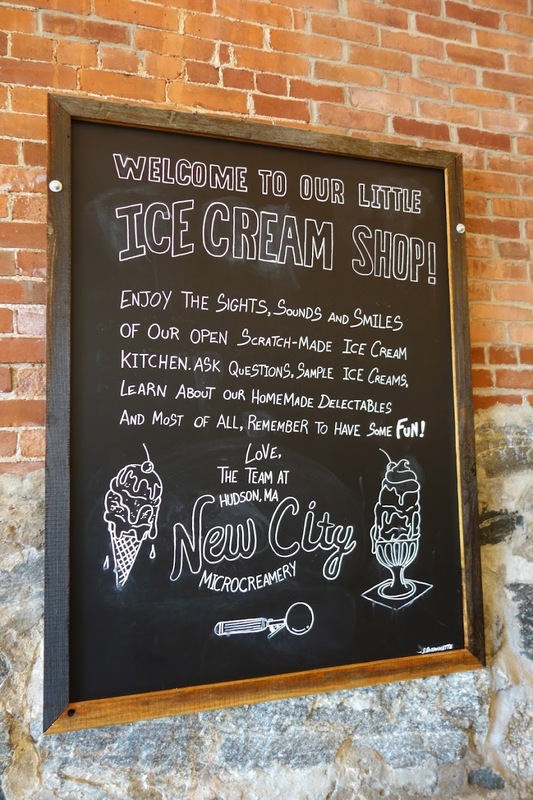 You can visit New City Microcreamery at 28 Main Street, Hudson, MA 01749. They are open every day from 10am - 10pm. Remember earlier when I mentioned that Karim and Michael opened their first restaurant in Hudson across the street? Well, after Karim and I sampled 25+ flavors of ice cream, we walked across the street to share lunch. Dessert first. Carpe diem, right? Come back tomorrow for my full report on lunch at Rail Trail Flatbread Co.
*Though my visit to New City Microcreamery was complimentary, all opinions are 100 percent my own. Dining Out: Rail Trail Flatbread Co. I hope you enjoyed yesterday's post about New City Microcreamery in Hudson, MA. I think I've re-read the post about 15 times and I get excited all over again every time. 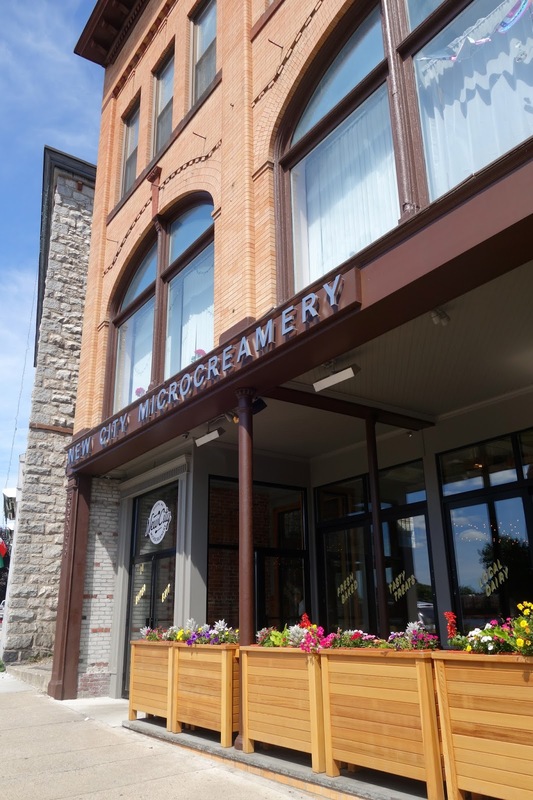 As I mentioned yesterday, New City Microcreamery was actually the second venture for co-owners Karim El-Gamal and Michael Kasseris. 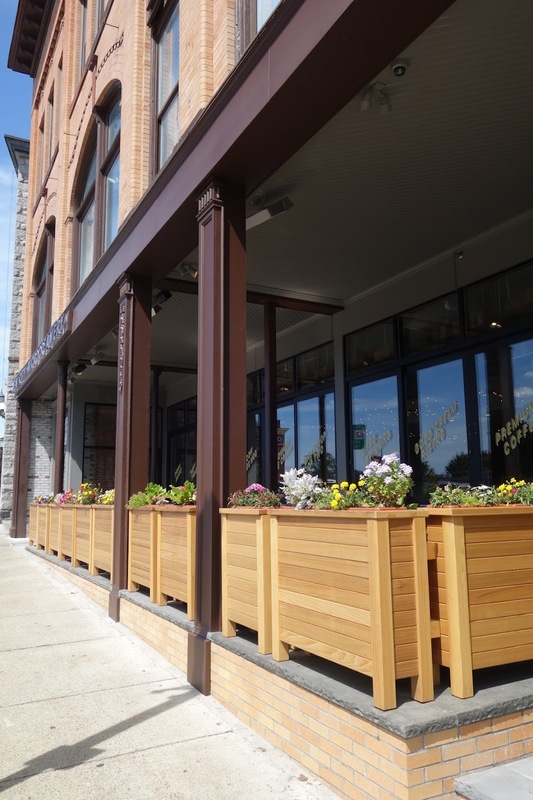 Their first baby, also in Hudson, is called Rail Trail Flatbread Co. This one is for all my MetroWest peeps. Tomorrow, Thursday, June 19th, Harvard Sweet Boutique in Hudson, MA will be opening its doors from 11:00am - 1:30pm to preview its newest summer treats. It's been a very decadent week here on Pop.Bop.Shop. On Monday we were pairing wine and donuts, yesterday we dove into a five course ice cream menu and today we're baking chocolate chip cookie dough cupcakes.